Porsche unveiled its Cayman GT4 Clubsport at the Los Angeles Auto Show earlier this week. 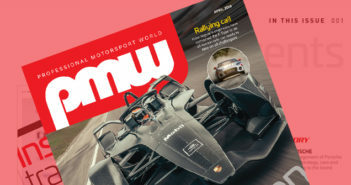 As covered in the 2015 Expo Special Issue of Professional Motorsport World magazine, GT4 is currently experincing a swell of popularity, with several manufacturers homologating cars for competition. Based on the recently launched road homolgated Cayman GT4, the competition version retains the same 385 hp mid-mounted, dry-sump flat-six engine but gains a modified version of the road car’s six-speed dual-clutch ‘PDK’ transmission and a mechanical differential. The Cayman GT4 Clubsport gains several components from the race-proven 911 GT3 Cup car, with the latter donating its ‘lightweight’ suspension struts, and rear transverse arms. Braking is provided through a Performance Friction-supplied system, which comprises 380mm steel brake discs all round paired with one-piece, six-piston aluminium fixed callipers at the front and four-piston equivalents at the rear. The braking system is complimented by a revised electronics package that sees a twelve-stage adjustable anti-lock brake system, whilst the Electronic Stability Programme has been recalibrated for use with the sticker 25/64-18 (f) and 27/68-18 (r) Michelin slick tires. Losing most of the production cars interior has helped the car to tip the scales at just 1,300kg – a 38kg reduction over stock. The interior gains a welded-in safety cage, a bucket seat and a six-point harness. The basic version is equipped with a 90-litre standard tank, with a optional 100-litre or 70-litre FT3 safety tanks available for endurance and sprint configurations. The new Cayman GT4 Clubsport is available from €111,000 (GB£77,642) (US$118,603) plus country-specific VAT and can be ordered immediately from Porsche Motorsport in Weissach. For 2016, homologation is planned for race series such as the VLN Long Distance Championship Nürburgring, the SRO GT4 series, the Pirelli GT3 Cup Trophy USA, the Ultra 94 GT3 Cup Challenge Canada and for club races run by the Porsche Club of America, as well as for other club-level meetings around the world.